Professor Sarah Spurgeon, Professor of Control Engineering at the University of Kent and the President of the Institute of Measurement and Control, delivered the 42nd annual Edwards Lecture. 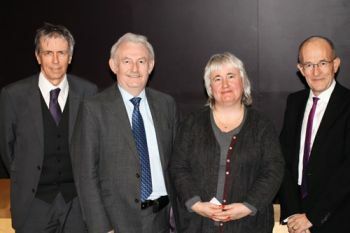 Professor of Control Engineering at the University of Kent, Professor Sarah Spurgeon, delivered the 42nd annual Edwards Lecture at City on 16th March in the Oliver Thompson Lecture Theatre. Using statistics from EngineeringUK, the President of the Institute of Measurement and Control also drew attention to the severe shortage of engineers in Britain, despite the fact that engineering delivered 27 percent of the country’s GDP in 2014 and that engineers earn a 15 percent wage premium over other professions. 182,000 people with engineering skills are needed every year to fill shortages in the country to the year 2022. She also stated that the UK has the lowest proportion of female engineering professionals across all EU states – European Labour Force figures show 8.7 percent of engineering professionals are female in the UK against 30 percent in some EU member countries. Against the wider international dimension, women make up 40 percent of the science, technology, engineering and mathematics (STEM) workforce in China, according to the Chinese Academy of Sciences. The Edwards Lecture Series is City’s longest running lecture series. It commemorates the work of F. D. Edwards, a member of staff at City's predecessor, The Northampton Institute, and Past Master of the Worshipful Company of Scientific Instrument Makers. The Lecture and supper following the event was attended by a wide spectrum of the City, University and engineering communities, with an opportunity for those attending to network in the foyer of the Oliver Thompson Lecture Theatre. City News spoke to Professor Spurgeon, a Fellow of the Royal Academy of Engineering, the UK's national academy for engineering, about control engineering, her career highlights and the complexities in tackling the STEM skills shortage. CN: In very simple terms, what is control engineering? How do we get more people interested in it and its impact on our daily lives? SS: A control engineer takes systems that are not performing to the specifications desired by the customer and creates new, improved systems. A control engineer works across a range of disciplines including cars and aeroplanes, robots and medical applications. Control engineering is what we call a hidden or underpinning technology. We don’t see it and it is not talked about. As Lord Browne said ‘“People think they know what engineering is but the evidence is they don’t – and in the UK the evidence is that we are very, very bad at telling them.” We need to talk about control engineering more to explain what it is and what it does. CN: Why did you study mathematics and engineering? SS: I chose to study mathematics and engineering and to become an engineer because I like creating solutions to challenging problems and seeing them implemented in practice. Engineers solve problems that help improve the lives of individuals and create a better world. Solutions to engineering challenges frequently require team work and I also like working as part of a team to solve problems. CN: What have been the main challenges and highlights of your career so far? SS: Engineering is a fabulous career and I have always enjoyed my work. I have been supported throughout my career by the Engineering community in the UK and the only challenges I have experienced have been intellectual ones. From the Atkins report, ‘Britain’s got talented female engineers – successful women in engineering: a careers research study’, we know that a fantastic 98% of female engineers find their job rewarding and this is well aligned to my own experience. It is very difficult to choose highlights as I have been able to do so many fabulous things. Engineering encompasses creativity and intellectual challenge as well as being very people centred. I enjoy solving problems that make a difference. I also relish educating the next generation of engineers at undergraduate and postgraduate level. CN: How can we get more girls and young women interested in STEM? SS: The particularly small number of women working in engineering in the UK is not reflected in many other countries. We have to learn from other countries where engineering is a more popular career for women and indeed where engineering is perhaps more valued by society. We must continue to talk about the work we do and promote a better understanding of the broad range of careers that are possible for the professional engineer. CN: Is it possible to tackle the UK STEM skills shortage in the short term, or is it more complicated? SS: The UK STEM skills shortage is complex. EngineeringUK is doing a marvellous job collecting data annually that enables us to not only understand our national position, but also allows us to monitor the success of interventions. The position is continually improving and it is a great pleasure to be part of a diverse community across the UK involving government, industry and business, the education sector and engineering professional organisations with a common goal to tackle the problem. We are making progress, but there is still much work to do.